Last Sunday it rained all day so we implemented the Standard British Rain Plan - a visit to somewhere educational. Luckily, this meant the informative and entertaining Museum of the Broads at Stalham. 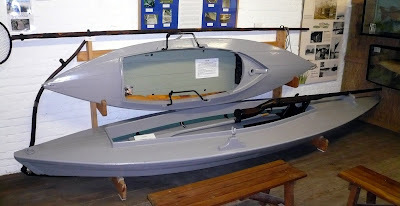 And waddayaknow, it had several duck punts on display, including this model based on the old photo below it in the case. 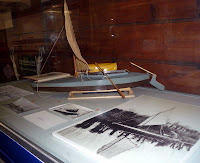 The centre of punt gunning in Victorian times was Breydon Water, the Broad near Great Yarmouth, and the museum has on display the last gun punt specifically built for hunting there. 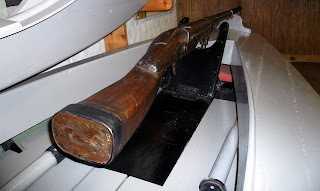 The punt (the lower boat - the other is a play boat made in Sussex) is 17ft long and carried a 1.5in gun. The gun was loaded with a pound of black powder and about 2lb of shot. Any old scrap metal could be used but the usual charge was mixed nails. The hunter would lie prone in the punt and stealthily row towards the roosting birds. When in position, he would knock the side of the boat sharply with the flat of his hand to send the birds into the air. Then he would pull the trigger, causing a tremendous blast and pushing the boat back as far as 25 yards. After that it was a question of clearing up. The dog would fetch the dead birds, and the wounded would be finished off with a shotgun known rather bluntly as a 'cripple-stopper'. Concern over the number of wounded birds led to a ban on 1.5in guns, after which only 2in guns were allowed. The punt was found floating in the River Yare in the 1960s, probably simply cast loose by an owner who had no further use for it. It was eventually restored by prisoners at Blundeston as part of their NVQ in carpentry. They added a replica gun as the original was lost. Although punt gunning is a thing of the past in the Broads, these unique and fascinating boats have a thriving family of descendents in the form of the Norfolk Punt. Norfolk Punts have the same long, low, flat-bottomed shape as the gun punts but with the addition of an unfeasibly large sail. They go like slippy stuff off a shovel if there are no waves. The Norfolk Punt Club races them from a pontoon moored in the middle of Barton Broad. 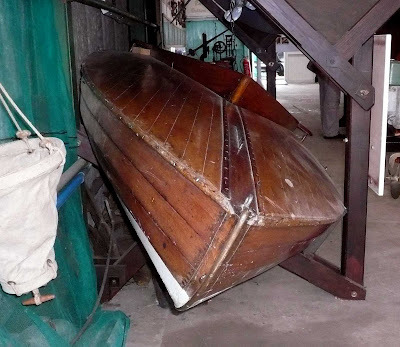 The museum has a splendid varnished example, unfortunately kept almost hidden under another boat. The Museum of the Broads is raising money to buy its premises, so if you would like to help this worthwhile cause click here and donate lavishly. i think you have made several errors in you article on puntgunning, to say that the gun would be loaded with scrap metal or nails is false - it would have been loaded with lead shot, nails or scrap metal would damage the gun, possibly with dangerous results,and a 1.5 inch gun wouldn't be firing a 2 pound charge, more like a pound or less. also there is no way the recoil would push the boat back up to 25 yards, 25 inches would be excessive, for every action there is an equal and opposite reaction, that gun would have been pushing a charge of at most a pound of shot, with perhaps four ounces of course black powder, consider the weight of the punt, the gun and the punt gunner laid in it, there is no way the energy released by the gun could be enough to push it back that far. you say that concern over crippled birds meant that only 2 inch guns were allowed - in fact the opposite is true, smooth bore guns with a bore diameter of over 1.75inch are no longer illegal. in fact 2 inch guns were made illegal and only smaller guns were in use - i'm sure no thought was given to the quarry when this law was passed. also it is not normal practice in punt gunning to slap the boat to lift the birds, in my experiance they are shot on the water or on the mud. The punt gunner would probably not have a dog with him, firstly due to space and secondly due to the difficulty of stalking with a dog in the punt with you. I know all this because i am an avid and active punt gunner and i hear a lot of misconceptions about the sport which saddens me. As a practising punt gunner I have never read such utter tosh. Who ever wrote this article on punt gunning should be ashamed of themselves there was obviously no research into punt gunning before this article was written. It would help if you could be a bit more specific about the errors, as Anonymous (1) is. Also less bloody rude.